"I'm a Wilderness First Responder - can I help you?" For nine days during the month of November I stayed at the Nantahala Outdoor Center doing an intensive program called Wilderness First Responder, WFR (pronounced Woofer) for short. @@What is a Wilderness First Responder? @@ This means I've been trained to deal with backcountry emergencies ranging from sprained ankles to a heart attack to a sucking chest wound called an open hemopnuemothorax. What does all this stuff mean to you guys? This means that I'd be an excellent person to have on a backpacking trip! My job as a hiking guide requires I have this training to deal with any injury or medical emergency that could possibly arise during a trip. Being that we are in one of the most remote places on the Appalachian Trail, help could be many, MANY hours from arriving. Learning the skills that are necessary for not only keeping my patient and group calm, but also how to help them and get more qualified help for them are mandatory. Here my quick and dirty summary of taking a WFR class at SOLO Southeast - taught at NOC in Wesser, NC. Our class was relatively small due to the time of year I took it. We had a total of 10 people, which is 1/2 to 1/3 of the usual size according to our instructor. Brooks, our main instructor, is an Advanced Wilderness EMT and teaches at SOLO when he isn't working in his wood shop making custom furniture. He's worked as a rafting guide and survivalist at BOSS in Colorado - the same survival institute Cody Lundeen attended in the 1970s. Our class was also diverse - ranging from a woman from Alaska looking to gain skills for her long winters to young people looking to be able to help their friends on trips, even a guy from Brazil who had spent a few months working on the Rocky Top AT crew in the Smokies. We spent the first day mostly in the classroom learning medical terminology and the legalities of helping people in the woods versus helping people in the "real world." Many of the training techniques I've learned are only applicable to working in the wilderness - meaning at least an hour from the trailhead/qualified help. The next several days were a crash course in learning how to deal with sprains and strains (and what the difference is between the two), building a splint for a fractured arm or leg, resetting broken bones in a wilderness setting, and even how to pull traction to get a broken femur back into place. I also learned how to help someone with a dislocated shoulder, elbow, or knee joint. We did a lot of practice building things from materials we would normally be carrying on a trip, like water bottles, sleeping pads, and even extra clothes and rain gear. Later in the week we learned how to deal with everything from minor sunburns to extreme frostbite and everything in between. The most helpful of all this training, however, was running what we called "scenarios." Each person in the class chose a partner and one of us would be the patient while the other would be the rescuer. They would use stage makeup to give us burns, broken bones, frostbite, etc. We would take turns helping each other and then learning from our mistakes - which they would always have us make the mistake on purpose as to not forget the proper treatment. We were also certified in CPR and the use of an AED during this period. My certification cards and my cool new t-shirt and patches! The real fun with this training started when we learned how to work together as a rescue group. We were always encouraged to try different roles, like lead medic or incident commander, and work with different partners to learn our strengths. I found this the most enjoyable experience of the entire training, mostly because I was extremely far outside of my comfort zone and working with different people kept me on my toes. I was very lucky to be part of a group where no one had an ego that got in the way of everyone making decisions as a team. Our biggest scenario came on the last night of the course, where we went up a trail in the dark to find three hikers who had gone missing in the woods. The scenario was a thunderstorm was in the area and the home base was concerned about lightening. The nine of us in the group walked in the dark up the trail until we heard people in pain. My partner, Derek, and I ended up getting an unresponsive patient who had obviously been struck by lightening. The other two patients had a case of ruptured ear drums and a dislocated elbow, respectively. To throw in a curveball, a fourth patient - a guy tripping on mushrooms - happened to walk onto our scene and take the attention of some of our rescuers. Nine people taking care of four patients is a lot of stressful work. In the end, it took us 2 hours to get our patients evacuated, and our instructors overall said we did a great job. Just another day at WFR training - a badly bruised ankle indicating a sprain. On the very last day, we did our written test and our final scenario. I partnered back up with Liz, whom I'd been working with all week. She was a great partner who provided a lot of constructive feedback to me. I seriously feel I wouldn't have passed the course without her! For her scenario test, I had fallen on a ski slope and broken my arm. She had to splint me and treat me for mild hypothermia. For my final scenario, she had fallen while bouldering in cold weather and needed treatment for mild hypothermia and a broken lower leg. The class ended on Sunday afternoon with sunny skies and nine people all getting certified as Wilderness First Responders. It was hard to say goodbye to everyone in the class because we had all bonded over the course of the nine days we spend together. Our group after "graduating" the WFR course. For anyone who is trying to figure out if becoming a WFR is worth the money, I would absolutely recommend the course - especially if you have no prior medical training. While the course was intensive and I was outside of my comfort zone (even though I have a 10-year history in medical careers), I feel like the information I've learned and retained was extremely helpful. 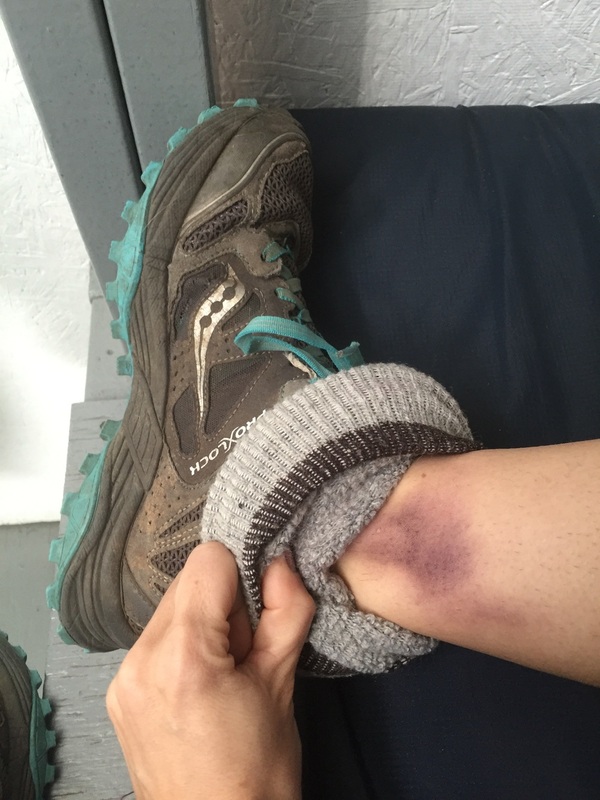 I wish I would have had this training prior to my thru hike just because so many things happened out there I could have helped with - like when a friend of ours began going into anaphylaxis on the side of a road in Shenandoah National Park or when NoKey fell and broke his fingers on Mt. Lafayette in New Hampshire. The SOLO Southeast Course was approximately $650 and the lodging at NOC for the nine days was about $130 in a bunkroom. Once you become a certified WFR, you will be qualified to take the Wilderness EMT classes (a 3-week, $1900 course) as well. If you are looking for a less intensive area of study, SOLO Southeast offers Wilderness First Aid (WFA) classes over the period of a weekend and they are significantly cheaper, although not as thorough as the training I received as a first responder. They also offer a simple CPR certification. Are you interested in becoming a WFA, WFR, or WEMT? I'd love to talk to you about it or even go into depth about the course with you! Leave me a comment below or start a conversation over on the Facebook post!